Anyways, I'm not sure why I thought of that specific dish just from ham, but it made me sort of reinvent the wheel. I took that Chicken Florentine concept and turned it into a pasta dish that didn't have a heaviness like most cream-based pasta dishes have. The use of cream cheese mixed with pasta water offers all the sauce you'll need to coat everything. 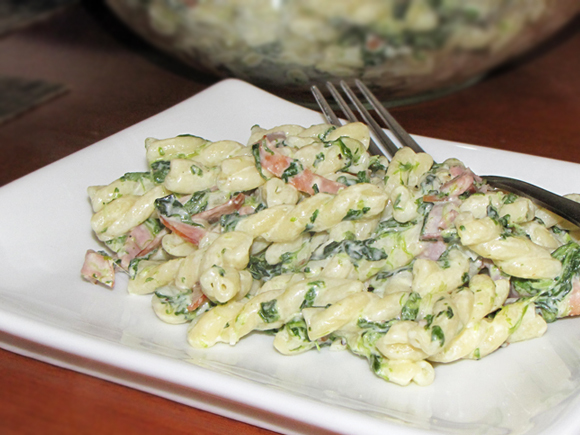 Parmesan cheese adds a nice tang and saltiness to the sauce and the spinach and ham round it out. The result is a light dinner that is satisfying and full of flavor. 2. Meanwhile, cut the onion and ham. 3. Thaw and drain the spinach. 4. Add the pasta to the boiling water. 5. Cook the onion and ham in olive oil in a large pan over med heat until onions are soft. 6. Reduce heat to low and add the cream cheese and parmesan. Stir until melted. 8. When noodles are al dente, remove them from the pot with a slotted spoon and add them directly to the pan with the onion/ham/spinach mixture. 9. Add the pasta water: Because the noodle-type you use makes a difference in the amount of water you need, add the pasta water a little at a time to make sure you don't use too much. Add more water as necessary if it's too dry. 10. Stir until coated and thickened slightly then season with salt and pepper.